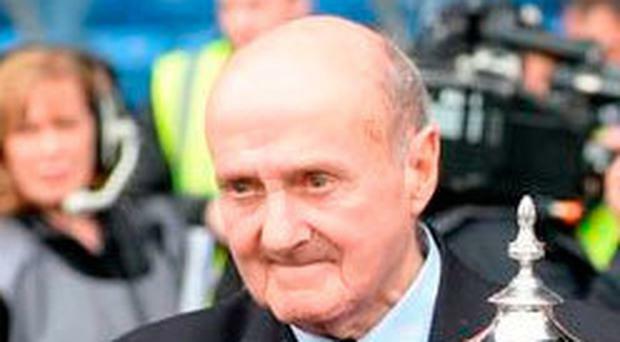 Former Rangers striker Johnny Hubbard has died at the age of 87. The South African played for the Light Blues over a decade in the post-war period. After leaving his home in Pretoria to sign for Bill Struth in 1949, he went on to lift three league titles and the 1953 Scottish Cup during his Ibrox stay. He was dubbed the 'Penalty King' on account of his lethal conversion rate from 12 yards, tucking home 65 out of 68 spot-kicks, including a run of 22 successful penalties. He made 238 appearances for Gers, netting 106 goals, and remains the only foreign-born Rangers player to net an Old Firm hat-trick following his 1955 treble against Celtic. He remained a regular visitor to Ibrox after his playing days and Rangers chairman Dave King admitted Hubbard will be sorely missed. "Everyone at Rangers sends their heartfelt condolences to the family and friends of Johnny Hubbard after the former Light Blues winger passed away peacefully today at the age of 87," he said in a statement. "Mr Hubbard wasn't just a great Ranger, he was also a wonderful person."